The U.S. is poised to spend $11.6 billion to upgrade a handful of nuclear bombs - with each bomb costing more than twice its weight in gold. The bombs were originally put in Europe to roll back a Soviet land invasion. 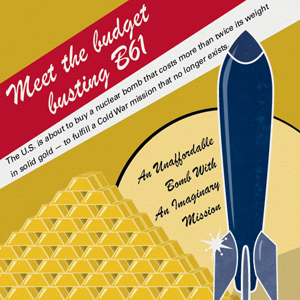 With the Cold War over, the costly bomb upgrades would rack up more debt while adding no benefit to our security. Why are the bombs still around? What else could the U.S. buy with the money? How much gold are we talking about? See the infographic below. SIPRI Military Expenditure Database, 2012 . "Throwing Money at Nukes" by The New York Times. May 26, 2013 . "Dubai Opens World's Tallest Building" by Douglas Stanglin for USA Today. January 4, 2010 . "Outcry Erupts over 1% Pay Raise Proposed for Military" by Gregg Zoroya for USA Today. April 24, 2013 .